Following the North Korean surprise attack on the South on 25 June 1950, U.S. troops ordered into action under the United Nations were rushed to Korea in early July. The first armoured units to arrive in Korea were drawn from the occupation forces in Japan. As the North-Korean forces were equipped with T34/85 tanks, heavier armour than the M24 Chaffee light tanks present in Japan were needed. Thanks to "Operation Roll-Up", a considerable number of armoured vehicles had been collected in Japan. After the fighting started in Korea, activity at the Tokyo Ordnance Depot shifted into high gear with about 8,000 vehicles being processed through the shops during July and August. These included several models of the Sherman as well as self-propelled artillery. In addition to repairs, some of the older M4A3(75)Ws were re-armed with the 76mm gun. Fitted into the smaller turret, it had the appearance of the expedient mount first tried in 1942. Although crowded, it again showed that firepower was the crucial factor. Despite its deficiencies, fitting the 76mm gun in the 75mm gun turret was a cheap way to up-gun older Shermans. Typical features of Shermans refurbished at the Tokyo Ordnance Depot were roadwheels fitted to both sides of the turret and four track blocks plus two sprocket flanges fitted to either side of the hull. Having successfully refurbished Half-Tracks, Jeeps and motorcycles during WW-II, Bowen-McLaughlin-York Co. (BMY) was contracted by the Department of Defense in the early 1950s to redesign, modify and rebuild existing vehicles for the Mutual Defense Aid Program. Among these were M4A1, and M4A3(75)W Sherman tanks and Priest M7B1 105mm Howitzer Motor Carriages. M4A3(75)Ws were modified into M74 TRVs, M7B1 Priests into M7B2s and the Sherman tanks were rebuilt and retrofitted with 76mm guns. Although the method of fitting the 76mm gun in the M34A1 gun mount was probably identical, there were some differences between the tanks refurbished at the Tokyo Ordnance Depot and those done at BMY. As opposed to the typical Tokyo Ordnance Depot features, BMY only fitted three spare track blocks flat to both turret sides. The BMY Shermans also had a new gun travelling lock on the rear hull, in addition to original one on the glacis. Torsion bars were fitted to the engine deck hinges to facilitate opening them (this feature was introduced on the M74 TRV converted by BMY and subsequently used on other rebuilds as well). Although the M4A3(75)W was orignally built with a raised bustle turret, several surviving examples have an earlier low bustle turret. These turrets must have come off earlier types of Sherman also under rebuild at BMY and apparently did not make sure a rebuilt turret was placed back on its original hull. Several MDAP recipients, including Denmark, Yugoslavia, Pakistan and Portugal, were supplied with these BMY-rebuilt Shermans retrofitted with 76mm guns. Scan courtesy of Bojan Ristic In September 2001 Bojan Ristic of Belgrade, Yugoslavia, sent me two scans of data plates he had removed from one of the two ex-Yugoslav Army Shermans, that were at the informal exhibition at one of the Knin YPA (Yugoslav People's Army) barracks back in 1988/89. The designation of these re-armed Shermans apparently was "TANK, MEDIUM M 4A3-E4 76MM". This concurs with the designation found in a document dated April 1952 on Danish Army MDAP material. 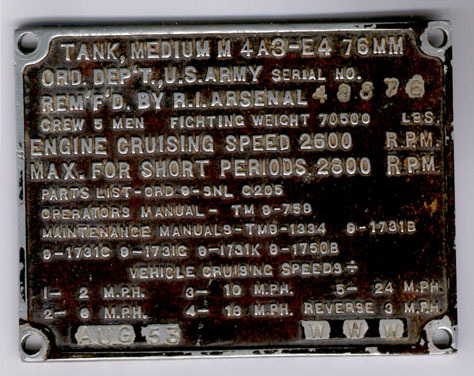 Sherman s/n 48876 was remanufactured by Rock Island Arsenal in August 1953, which means that besides BMY there was at least one other contractor. Scan courtesy of Bojan Ristic The second data plate shows dimensions and weights (vital for shipping to friendly nations?) 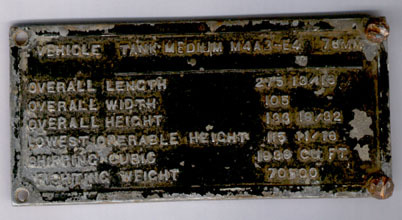 and again the designation "TANK MEDIUM M4A3-E4 76MM". Scan courtesy of Bojan Ristic. 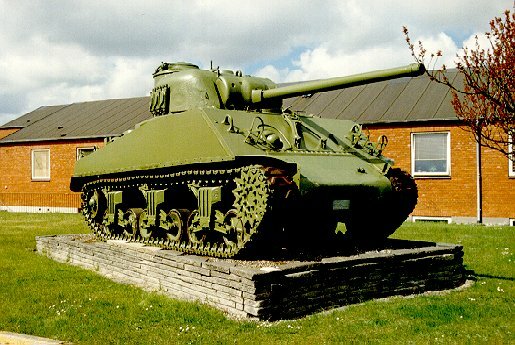 Scan courtesy of Henrik Clausen Preserved Danish M4A3(75)W retrofitted with 76mm gun at the Dragonkasernen (military garrison), Holstebro, Denmark. Note the three track blocks on the side of the low bustle turret and the appliqué armour on the right hand front quarter. Scan courtesy of Henrik Clausen Another Danish Sherman preserved at Naestved, Denmark. Note the second gun travelling lock on the rear hull, torsion bars on the engine deck hinges and the low bustle turret. 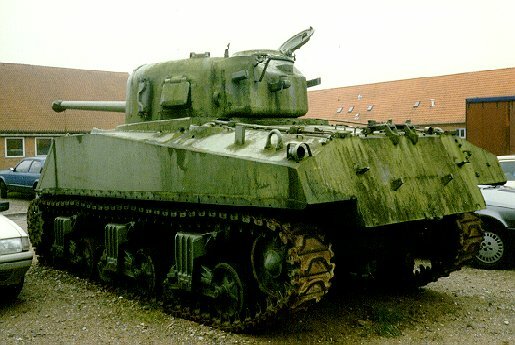 These are all rebuild features, the standard production M4A3(75)W was orginally fitted with a raised bustle turret. Hunnicut, R.P., SHERMAN: A History of the American Medium Tank. Second edition. Novato: Presidio Press, 1978, p.494-495 (ISBN 0-89141-080-5).